The manufacturing process of vaccines is complex but can be oversimplified into a few steps. First, a bacteria or virus (or a part of one) is inactivated so that it can no longer make us sick but can still cause our immune system to recognize and respond to it by building an immunity. The weakened pathogen is then mixed with a chemical adjuvant. 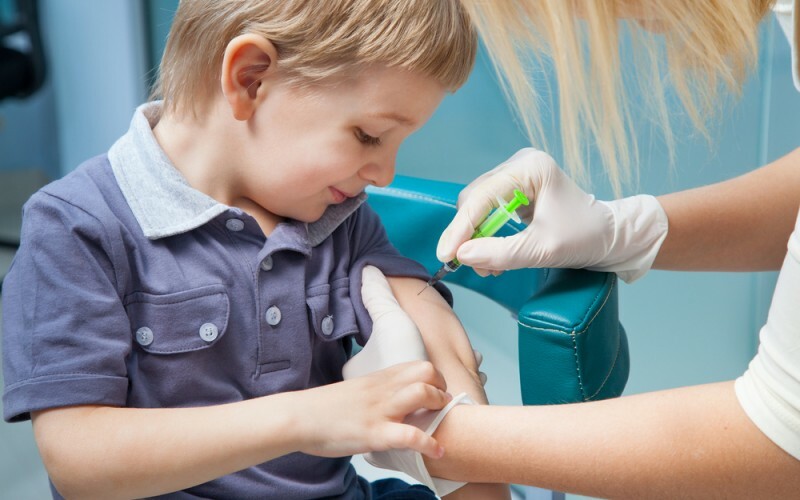 An adjuvant is a solution designed to boost the immune response to the vaccine so that the smallest amount of pathogen and the fewest doses possible can be given. Finally, the solution is preserved for transport and storage to prevent the growth of other bacteria, viruses, or fungus within the solution. Along the way, chemicals are added and removed. Some of these chemicals get a bit of attention and are worth examining in order to feel comfortable with the decision to vaccinate. 1. Formaldehyde is a chemical found in very small quantities in some vaccines. It is used to inactivate toxins in toxoid vaccines, as well as to kill viruses and bacteria that might contaminate the vaccine during manufacturing. The majority is diluted out before the final packaging of the vaccine. Formaldehyde is also a chemical found the human body that is involved with the synthesis of DNA and amino acids. Humans are most commonly exposed to formaldehyde in air released by typical household objects, such as new carpet, panel board, and nail polish (to name a few) as well as by cars and cigarette smoke. The small amount of formaldehyde in vaccines is far below the amount found even naturally occurring in our bodies. 2. Thimerosal is a chemical that caused some controversy back in the late 1990s. Thimerosal is a preservative that contains a chemical called ethylmercury. Despite many excellent studies that disproved any link with developmental delay or autism, thimerosal was removed from vaccines with the exception of the influenza vaccine in 1997. The nasal flu vaccine does not contain thimerisol or any other preservative. 3. Aluminum is used in some vaccines as an adjuvant — that is, to boost the immune system’s response to the vaccine. It is not used in the MMR, varicella or rotavirus vaccines. According to the Vaccine Education Center at the Children’s Hospital of Philadelphia, the total amount of aluminum given in vaccines in the first six months of life is less than that received through breast milk or formula during the same period of time. 4. Gelatin is found in some vaccines to prevent damage from heat or freeze drying. The gelatin is of porcine (pork) origin. While gelatin is not dangerous for most people, in a very few it can cause an allergic reaction. Anyone with a known gelatin allergy should inform their doctor before receiving vaccines. Many components of vaccines have chemicals we are exposed to every single day in greater numbers. While gelatin is not dangerous for most people, in a very few it can cause an allergic reaction. The amount of formaldehyde found in vaccines is smaller than what is already found in the human body. Children’s Hospital of Philadelphia. Vaccine Education Center. Centers for Disease Control and Prevention. Ingredients of Vaccines Fact Sheet. Great article addressing the common concerns many parents have!